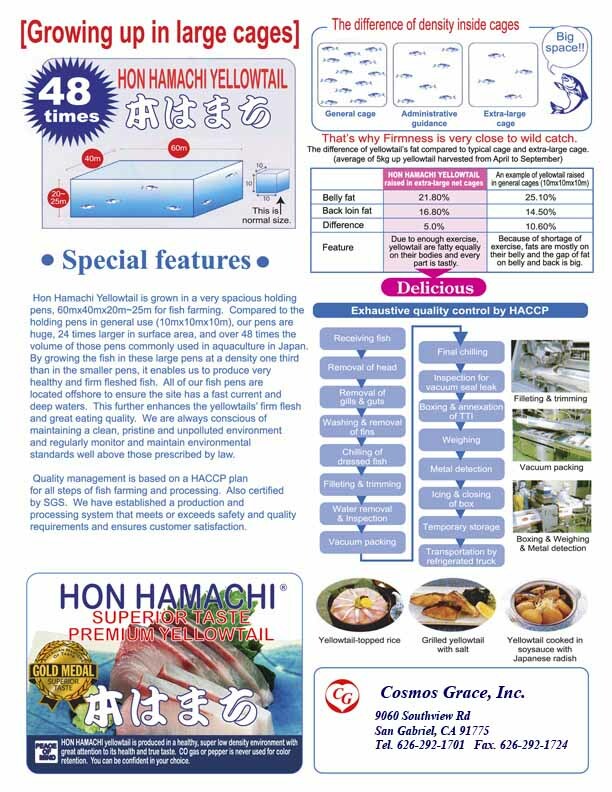 Hon Hamachi is specifically raised to cultivate the tastiest and healthiest type of yellowtail. The combination of larger and lower density cages and wholesome feed allows for these fish to grow in a more desireable manner. The larger cages allow for more exercise, which promotes an even distribution of fat throughout the body, which essentially yields tastier fish. The holding pens are 60m x 40m x 20~25m (compared to the standard 10m x 10m x 10m) and are 24 times larger in surface area and over 48 times larger in volume. Raising fish in these larger pens, at a density one third of those commonly used in aquaculture, enables the production of healthier, firmer fish. These fisheries are also conscious of maintaining a clean, pristine and unpolluted enviornment and regularly monitor and sustain enviornmental standards, well above those prescribed by law.